Shortly before the first headlines claiming that the conservatives' 1922 Committee had finally reached the 48-letter threshold to call a no confidence vote in Theresa May hit the tape, Deutsche Bank analysts published an extremely timely update to its projected Brexit outcome odds that featured a decidedly bearish tilt. In the wake of last week's historic contempt vote that forced May to publish the damaging attorney generals' findings (which confirmed the worst-case scenario touted by Brexiteers in their warnings about the UK potentially becoming a vassal state), DB has raised the odds that May could be ousted either in an intra-party no-confidence vote or a (significantly more bearish) no confidence vote in May's government (which could clear the way for a general election). Regardless of whether May manages to hold on to power, DB's "base case" for the timing of successful passage of a deal has shifted to Q1 (something that analysts at Goldman Sachs had pegged from the beginning, noting the tendency for any negotiations involving the EU to go down to the wire). However, if May manages to secure "meaningful clarification" from the EU regarding the Irish backstop (something that most analysts believe to be unlikely, given senior EU bureaucrats' insistence that negotiations cannot be reopened) it's possible a vote on the current deal could come before lawmakers leave for their holiday recess on Dec. 20. As it stands, DB analysts believe the three most likely scenarios for reaching a deal (presumably, a deal will be reached, they believe, given the absence of any meaningful political will for a 'no deal' Brexit) are: Abandoning the backstop in favor of the earlier Northern Ireland-specific backstop (which could win over votes from Tory backbenchers but alienate the DUP), using the political declaration to reach some kind of compromise with Labour (which the analysts admit is unlikely) or deferring a vote on the current agreement until next year, where May has set a 'hard' deadline of Jan. 21 for a vote. There are three possible alternatives. The first is that the UK wide backstop is scrapped altogether in favour of just a Northern Ireland specific backstop (i.e. that the government return to a previous draft of the Withdrawal Agreement). Assuming the EU27 agree, this could win more support for the government from Conservative backbench MPs, but would lose the government support from the DUP. It is not clear whether this could win support from Labour MPs - our view is this is unlikely unless changes are made to the political declaration on the future relationship. In these circumstances, the government would still face defeat in parliament. The second option is that Prime Minister May decides to create room for compromise with Labour backbenchers by utilizing the political declaration on the future relationship. At this stage such an outcome looks implausible but given the extremely fluid political situation cannot be ruled out. 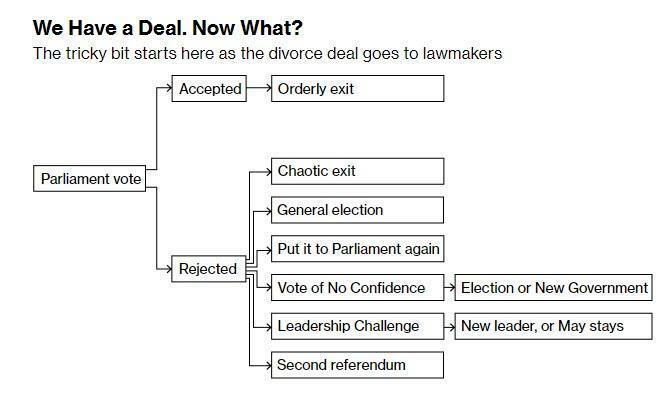 Such an outcome would be the most bullish, as this path has the highest chance of securing the government a majority in the House of Commons. The third option is that Prime Minister May stalls for time, and defers a parliamentary vote until the New Year. In these circumstances the 'hard stop' for the government is the 21st January. According to the Brexit Withdrawal Bill, should the government fail to reach agreement with the EU27 by that date, a minister must give a Statement to the House of Commons and the House of Commons would vote on a neutral motion either approving the government's plans or rejecting them. Whichever option May chooses, if her deal is ultimately defeated in a vote, it would open the door to a no confidence in her government and - possibly - general elections. This outcome would be extremely market negative. In our view, should a vote be put before the House of Commons without an attempt to reach across party lines, the government is likely to be defeated. Our prior had been such a defeat could create the political room for a compromise, but with Prime Minister May having staked so much politically on her current Brexit agreement, this is now less certain. As a result, the prospects of Prime Minister. May either being forced out in a Conservative no confidence motion, resigning, or the government falling in a vote of no confidence have increased. May passes current deal or modified softer Brexit agreement through parliament: 50% (previously 65%). May loses confidence vote or resigns, or government voted down by DUP and early general election: 30% (previously 10%). Second referendum: 20% (previously 25%).